As you can see from the image to the right and above, when you first look at the BA-07 BinoArmor Deluxe, it looks like most other binocular carry cases and it is only when you open it, that you realize that this is a little different from the norm. 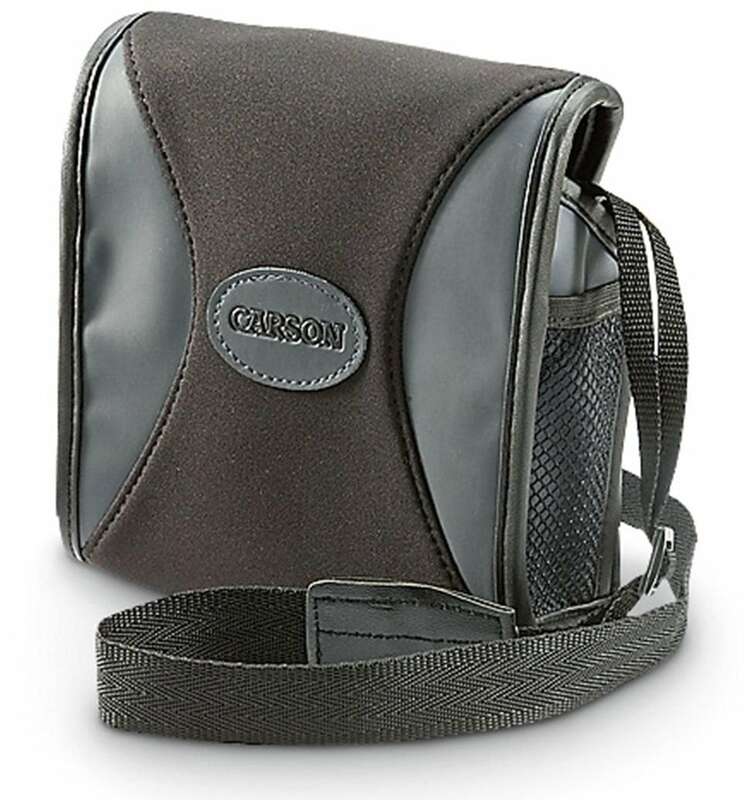 Unlike most cases where you put your binoculars inside, the Carson BinoArmor is basically a protective case, that fits to and wraps around your binoculars. It is made from neoprene that is lightweight, pretty well cushioned and will protect your binoculars from rain and most other bad weather conditions. So because of this simple but very clever design, the Carson BinoArmor Deluxe eliminates the need for using lens caps and a rain guard, which as you probably know can be awkward, easily lost as well as time consuming to remove and replace when out in the field. Another small but clever feature that differs from most binocular cases is the way that it is held closed. Carson have decided to use a fairly powerful magnets, that are positioned on the main flap as well as on the side panels. This "magnetic closure system" not only holds the case firmly closed, but it allows for quick and even more importantly almost silent opening and closing. At first this may seem trivial, but it can really help if you want to remain undetected especially when observing easily startled birds and other wildlife. 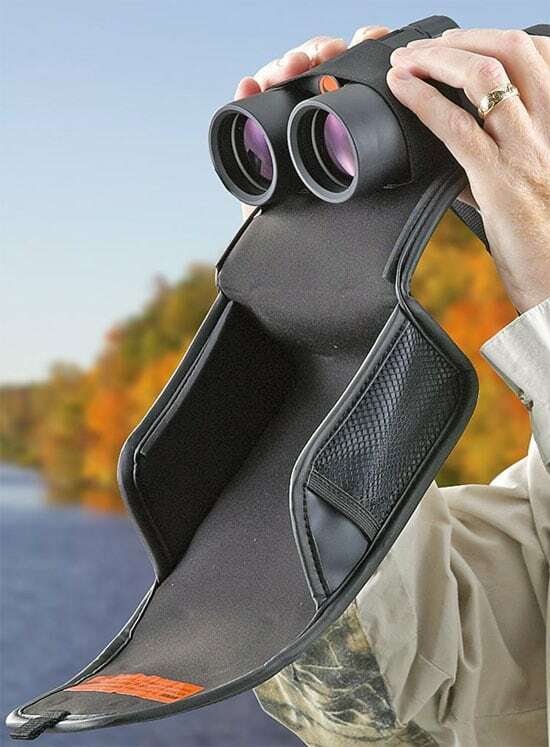 But the biggest advantage of the BinoArmor over most other cases is the fact that you can use your binoculars without having to completely remove the case, which saves you a huge amount of precious time. Inside the case your binocular is held in place with a 4cm wide elastic strap, so as you walk through brush, the case remains wrapped around your optics, keeping them fully protected. Then when you need access your optics, to view a subject, you simply pull the front case panel open and use your binoculars with the case still attached. Once again the magnetic clasp ensures that this is almost silent and this simple process is very fast, unlike having to remove your binoculars from a standard case and possibly then having to remove your lens caps in the traditional way meaning that you will always be ready for viewing at a moment's notice. 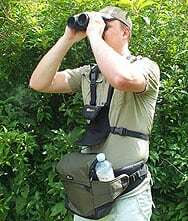 Sure many people who use a standard binocular harnesses will do so without a case to protect them and you can't access your optics quicker than that. But on the down side, your optics are far more vulnerable to damage, be that from the weather or from knocks and scratches. So for me, I would say that the BinoArmour offers a great compromise between speed of access and protection. I also really like the fact that you can use the Carson BinoArmor Deluxe in conjunction with a standard neck strap or indeed for best results with a standard binocular harness when out in the field. Carson BinoArmor binocular wrap will fit most full sized roof prism binoculars with objective lenses of about 42mm models - I measured the internal dimensions of the case to be about 13cm (5.1in) wide by 18cm (7.1in) long and 5cm (2in) deep. It can take a little head scratching when you first set up this wrap around case to work with your binoculars, but once you have done it once it is obvious. To help, I have written out the instructions on how best to do it below. Step 1: Open the case and pull the thick elastic band located inside the case over your binoculars. Step 2: Position your binoculars in the center of the BinoArmor under this strap in the position shown in image above. Step 3: Wrap the BinoArmor around your binoculars and secure with the magnetic closure. This process is almost silent unlike the Velcro strips or clips used on many other cases and is actually an really important feature when observing timid birds and other wildlife. Step 4: To open and use your optics, simply open the flap, which is once again silent and pull away from your body. Step 5: Your binoculars can then used instantly, without the need to remove the rest of the flap, saving you time and with no need to remove rain guards or lens caps that are often awkward and time consuming to remove in the field. I love the Carson Deluxe BinoArmor case, the design is so simple and yet it just works so well. The biggest advantage of these over a standard case is just how quick it is to go from having your binoculars fully protected to using them and vise versa. 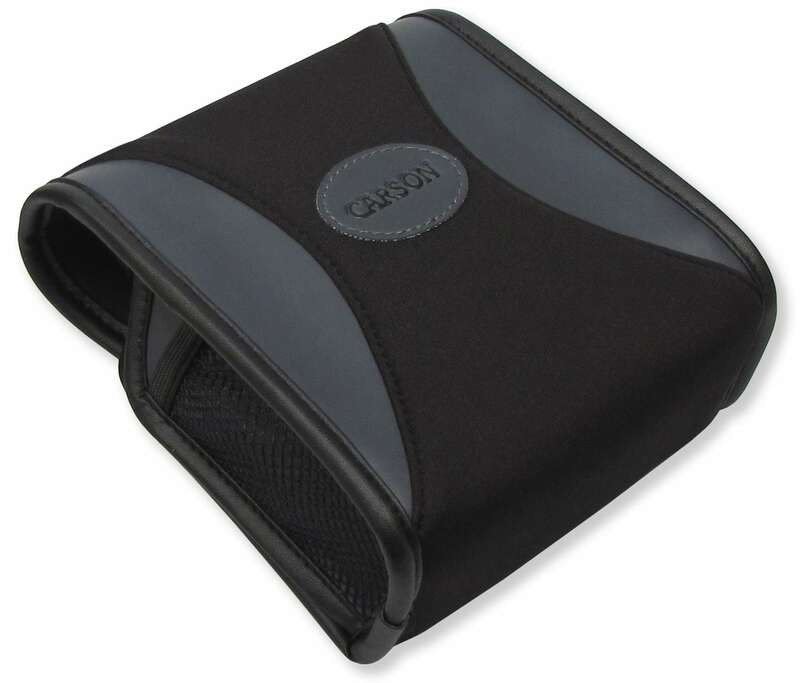 The case itself looks to be very well made with high quality materials and the magnetic closure system is great and I love the fact that you can keep your binocular protected from the elements even when using a binocular harness. It is for these and all the other reasons that I have already mentioned that I have no hesitation in highly recommending the Carson BinoArmor as a better alternative to all other standard carry cases that I have ever seen. 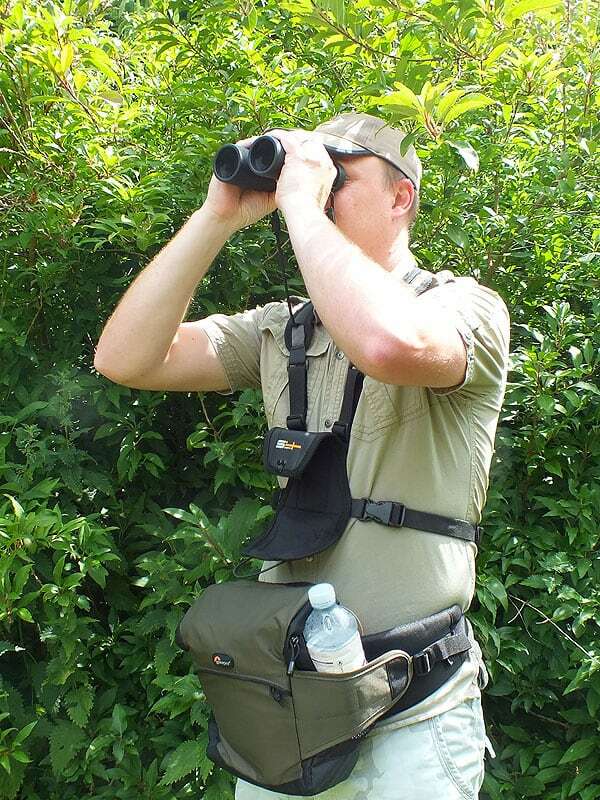 If you are looking for an all in one binocular harness and protective case, then I also highly recommend the LockDown Optics Deployment System that like most standard harnesses attaches the binoculars against your chest, but it does so in such a way as they will definitely not swing or even move around, yet it still fits very comfortably to your body and makes carrying even heavy binoculars for a long time no problem at all. The LockDown System also makes accessing your optics as well as returning them to your chest very quick and unlike other more conventional binocular suspenders or harnesses, you don't have to put up with your binoculars being pulled against your face, this is because of the design with their "shock cords" they offer tension free glassing. I would like to thank Carson Optical, Inc. for sending me the BinoArmour case to review. I would also like to point out that all the reviews on this site, including this one are my opinion and are not influenced in any way by manufacturers, distributors or suppliers. Best Binocular Reviews Annual Binocular Awards 2010, 11, 12, 13, 14, 15 & 2016!